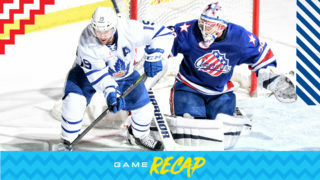 The Toronto Marlies continued to gel in the second half of Monday’s home opener against the Monsters, but ultimately were unable to come back from an early deficit at Coca-Cola Coliseum. The day started out with a celebration of last year’s Calder Cup championship, but it was Cleveland who started the scoring with a pair of goals in the first six minutes with Ryan MacInnis and Justin Scott getting the goals. Chris Mueller converted on a power play ten minutes later, taking a perfect pass through the slot from Dmytro Timashov and connecting on the one-timer. Carl Grundstrom had the secondary assist. Michael Prapavessis added another for the Monsters before the first intermission, with Zac Dalpe extending the lead to 5-1 with two goals in the early second. 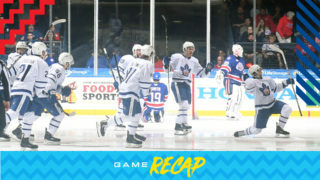 The Marlies cut into the lead as Sam Gagner scored just 16 seconds after Dalpe’s goal, roofing the shot to cut the deficit to three. Grundstrom had his second assist of the night on the goal. Calle Rosen made it a two-goal game with a bullet from the top of the circle just before the second intermission, firing a one-timer off a pass from Jordan Subban. Gagner had the other helper. The Marlies poured on the pressure in the third, outshooting Cleveland 20-2, but were unable to add any others as the game finished 5-3. Kasimir Kaskisuo made 19 saves for the Marlies while Jean-Francois Berube had 37 for the Monsters. Both teams went 1-for-5 on the power play. Chris Mueller scored the Marlies’ first goal at 15:49 of the first period on the power play. Mueller has four points (2 goals, 2 assists) in three games. Sam Gagner scored at 4:46 of the second period and later added the secondary assist on Rosen’s second period goal. Gagner has five points (3 goals, 2 assists) in his last two games. Calle Rosen scored at 17:56 of the second period. Rosen has four points (1 goal, 3 assists) in the first three games of the season. Dmytro Timashov recorded the primary assist on Mueller’s first period power play goal. This was Timashov’s second assist of the season. Carl Grundstrom registered the secondary assist on Mueller’s first period goal and the lone assist on Gagner’s second period goal. Grundstrom has two points (1 goal, 1 assist) in three games this season. Jordan Subban had the primary assist on Rosen’s second period goal. Subban three points (1 goal, 2 assists) in three games this season. Kasimir Kaskisuo stopped 19 of 24 shots. Kaskisuo is now 1-1-0-0 on the season with a .886 Save Percentage and a 4.17 Goals Against Average. Toronto went 4-for-5 on the penalty kill and 1-for-5 on the power play. Toronto had a 40-24 edge in shots in all situations. 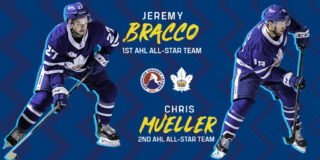 Chris Mueller and Jeremy Bracco led the Marlies with five shots on goal. The Marlies are 1-2-0-0 against North Division opponents and 0-1-0-0 against the Cleveland Monsters. Obviously, it’s another sloppy affair by us. I thought we got better as the game went on which at this stage really is what we are looking for. I thought we played some good hockey in the second half of the game – granted, I don’t think we got the best of Cleveland. We are trying to clean up our process and how we are playing. That was really the goal of the weekend so it’s really encouraging to see that. I thought it was excellent. It was great to be able to honour last season’s team. It’s a great moment, a special moment. Takes you back to just how hard that whole process was to go through that and how great it feels. Quickly get a reminder of how the page has turned and it’s a whole new opportunity here now. 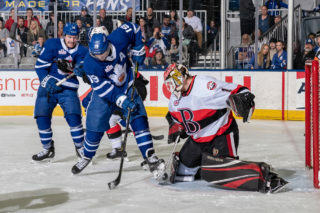 The Toronto Marlies hit home ice today for the first time since June 14 when the raised the Calder Cup following a 6-1 win over the Texas Stars to secure the first championship in franchise history. In a special pre-game ceremony, this time the raising will be a banner to forever mark the accomplishment. 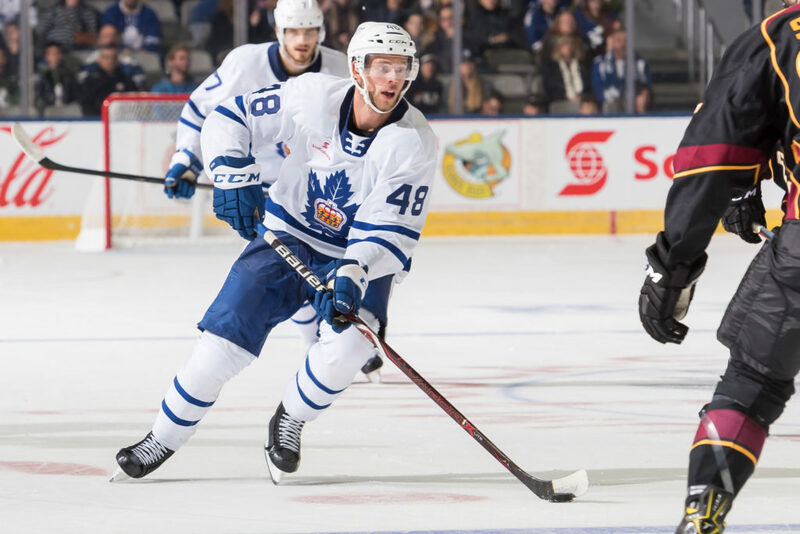 On the ice, the Marlies are looking to bounce back from a loss in Binghamton on Saturday, where they fell 7-5 to the Devils. Offensively, the Marlies are rolling early in the season, combining for 12 goals through their first two outings on the year. 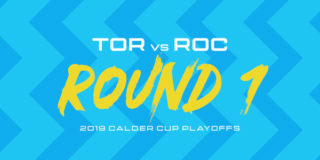 Trevor Moore has scored three times through the first two games, leading the Marlies on that front, but Sam Gagner (2G, 1A), Chris Mueller (1G, 2A) and Calle Rosen (0G, 3A) are all tied with Moore in points in the early going. 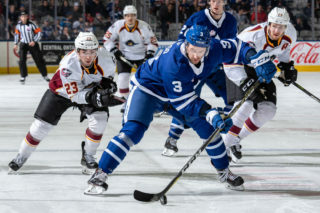 Monday’s game will be the Marlies first look at the Cleveland Monsters, who join the North Division after finishing at the bottom of the Central last season. The Monsters are out to a flying start, winning their first two games on opening weekend. Rookie Eric Robinson has three goals in those games while Zac Dalpe has a pair of goals and assists. Puck drop in today’s game is scheduled for 3:00 and tickets are still available. Fans can also tune in to all the action on Leafs Nation Network or AHLTV. Follow us on Twitter and Instagram for updates and behind-the-scenes content all season long.